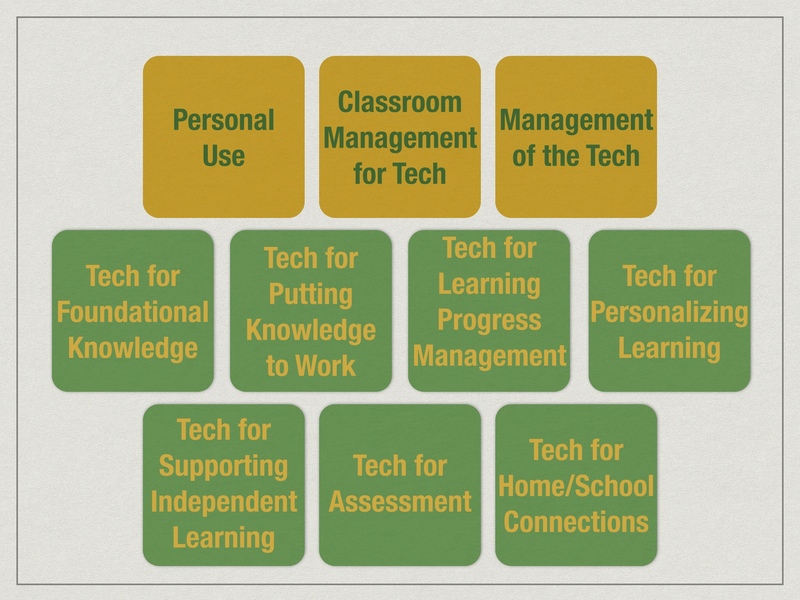 We have posted a draft, partial curriculum grid for professional learning around technology integration. By partial, we mean it is incomplete. But we’re posting in hopes of finishing it collaboratively. You’ll see that it is built around our “10 Professional Curriculum Buckets for Technology Integration” (and that we’ve added a bucket or two) and is based on that we need to focus on learning when exploring educational technology, that we need to stay focused on the pedagogy, not the tools or the stuff. This project has come as far as it has come because of the educators who have been willing to share, collaborate, lead, and help out! Thanks so much! ACTIVITY/UPDATE: Please Review These Curriculum Pieces. Do the Learning Targets seem to be named appropriately (or do you have a better suggestion)? Does the organization of the Learning Targets within the Measurement Topic make sense? Does the organization of the “Knows & Dos” within each Learning Target make sense? Are there any missing “Knows & Dos” that we should consider including? Are there any Learning Targets for that Measurement Topic that we should consider adding (and if so, would you recommend the “Knows & Dos”)? Any other suggestions for edits or revisions? Many thanks for Kathy Martin (principal in RSU4) for coming over and helping me get started last week. She shared RSU4’s capacity matrix for Empower/Educate (so, by extension, I should thank Norma-Jean Audet and Cathy McCue, too! ), which we used as a format for framing the professional learning curriculum work. It let us punch out a less RSU4-specific version of the Empower curriculum, then draft the Personal iPad Use curriculum (using some ideas and activities from the initial training Auburn does with primary grades teachers). Thanks to Shelly Mogul for helping me make the Capacity Matrix Template a little more user friendly. Knowing that we want this to be an Auburn & Friends project (in this case, emphasis on “& Friends.”), we tried to keep the learning targets somewhat generic. If your district uses iPads, we wanted you to be able to use the Personal iPad Use Capacity Matrix and didn’t want it to be too “Auburn-specific.” Same with Educate/Empower. At the same time, we wanted you to be able to use our capacity matrix as a model if you do things differently than we do. So, for example, if you use MacBooks or Chromebooks, etc., instead of iPads (or if you use Project Foundry or Jump Rope instead of Empower, etc.) we wanted you to be able to use the capacity matrix here as a model (perhaps without making too many changes) for creating your own capacity matrix for the device (or program) that you do use. We started realizing that the Curriculum is different from the Modules/Pathways/Badges. There is certainly a lot of overlap and they are closely related, but they aren’t the same. I think all my years teaching high school somehow convinced me that the curriculum and the course were the same… At first, I was expecting the curriculum to look more like a training agenda, but realized that was really the badge/module – the activities you do to learn the stuff we want folks to know and be able to do. So, to be clear, we’re only really working right now on defining the curriculum. Building out some modules or badges will come soon. And we’re starting to gain clarity on how the two are different (the curriculum work focuses on what teachers should understand or be skilled at, and the badge work focuses more on learning tasks, learning resources, and assessment options). The curriculum just tries to define the learning targets, not how you’ll get there (they’re 2 different things). Also, some of you who have done this kind of Customized Learning curriculum work in other contexts will know that we still need to cycle back sometime soon and connect a more descriptive rubric (scale) to each Learning Target, including assigning a taxonomy level to each 2 and 3. After attending the Open Badge Forum last spring with Erin Knight, and learning a lot about the work going on (globally) about badging, and especially about the Open Badge standard for badges, and after working with Ben Wilkoff and others on figuring out what we might want for criteria for a badging platform for this project, I was planning on spending some time reviewing various badge platforms and choosing one for this project (hopefully with some input and collaboration from some of the Distributed PD Team). Educate/Empower is the learning progress management system we are using to track and monitor student learning and to help make the curriculum and learning opportunities transparent and navigable to students (and parents). The advantage, of course, is that we could manage our professional learning in the same platform where we manage our student learning (and, of course, do some modeling for our staff). So, Scott Bacon, the Empower developer, was around so I met with him. I gave him an overview of the Distributed PD project and said I wanted to see if Empower could meet our needs. He got excited about our PD work (he has been wanting to extend Empower’s reach to professional learning), and started showing me. Mostly, I was impressed with how easy it would be to navigate our professional learning curriculum (as we develop it and upload it to the system). And how powerful the tools were to create various learning pathways and learning “playlists.” And I was really impressed with how this would model (powerfully) for the adults in our schools how we envision the learning for the students in our schools (ok, I know I just mentioned this in the paragraph above, but this is too big an idea not to repeat!). Also, I didn’t realize that Empower can now do badges (linked to Pathways). The badges right now are simply badge images (which we can design) linked to fulfilling certain requirements (demonstrating certain proficiencies), and are not currently Open Badge compliant, but Scott is clearly committed to making them Open Badge compliant (so I made sure he had the Open Badge website and standard). Much more importantly, it is easy to build out a new curriculum, connect people or groups to it, associate tasks/activities, resources, and assessments to targets, etc. We will continue on our curriculum work, and set up an Auburn Professional Academy instance of Educate/Empower. Back in May, I had the chance to work with Ben Wilkoff (Denver Public Schools) to discuss criteria for selecting a badging platform for professional development. Transferability – Ability to take a badge or series of badges from one place to another. Image support for badges – standards for badge creation. Alignment to competencies – defined within Auburn. It should be noted, too, that there is a standard for badging: OpenBadges (and the standards here). As much as possible, what ever badging platform we select, we would like it to meet the OpenBadges standard. ACTIVITY: What Should Be Our Criteria For a Badging Platform? Before we are fully ready to start issuing badges for technology integration, we will need to select a platform for creating, issuing, and managing badges (either self-created, or subscription services). The temptation always is to simply look at one or two we know about and announce which one we want. But Pickering and Marzano remind us that doing a good job with the Complex Reasing strategy of Decision Making requires that we first establish criteria for making the decision. Carefully establishing criteria can help us make a “best fit” system choice for us (and possibly avoid costly changes later made necessary from a speedy or haphazard choice now). What would be important to have in a badging system? What would we want to be sure to avoid? What features match and support our goals? What should we consider that perhaps we haven’t thought of before now? This activity will help us decide what criteria we should consider while selecting a badging platform. Please read over the steps below, then return to work through the steps, recording your thoughts in the shared notetaking document. Start by brainstorming a list of criteria that come to mind right now. (Don’t worry if not much comes to mind at first, we will be adding to this list.) Keep some notes; you’ll have a chance to share your list. Please review, or skim, the following documents about badging. What do they suggest we should consider as criteria? Please look over these badging platforms, not from the perspective of which one we want, but rather from the perspective of what might examining these platforms suggest we should consider as criteria for making that choice? Once the work group has had an opportunity to post their suggestions for criteria, we will meet to review those suggestions, and discuss which are best to use. Once we settle on our list, we will rank and weight our list. Once our criteria list is ready, it will be time to do a thurough search of badge platform options for review (using our selection criteria). Please open, add your participant info and contribute to the note taking.